Tenants forced out of a Chinatown apartment building earlier this year for an unstable staircase said their landlord tossed their belongings in a construction dumpster while doing repairs Wednesday. Images posted to Facebook show tenants at 83 and 85 Bowery foraging through black garbage bags for their belongings Wednesday, pulling out watches, medicine and children's books that had been mixed in with refuse while crews did asbestos repairs on the building. It's the latest salvo in the saga of the tenants' fight to get back in the building since being vacated on Jan. 18 for the staircase and other code violations in what was initially thought to be a two-week ordeal that has stretched to nearly three months. "This is how the landlord did it today: by mixing them with garbage and dropping them into a dumpster," said advocacy group Youth Against Displacement in one post. "The tenants had to go through every garbage bag and picked out usable stuff, but in the end had to give up because usable stuff had become unusable." News 4 has reached out to landlord Joseph Betesh's company and his spokesman via email seeking comment. But in a statement to am New York, which first reported on Wednesday's action, the spokesman said none of the items thrown away were usable. “Some items removed from the building were discarded because they were perceived to be perishable food or in contact with perishable food and/or other unusable items,” the spokesman told am New York in an email. The spokesman told the newspaper other items would be taken to storage facilities where families will have direct access and that Betesh's management company is "committed to moving the families of 85 Bowery back safely into their homes as quickly as possible." The city Department of Buildings spokesman said that it decided to partially lift its vacate order so tenants could get their belongings, and the landlord opened the building for several days recently for tenants. 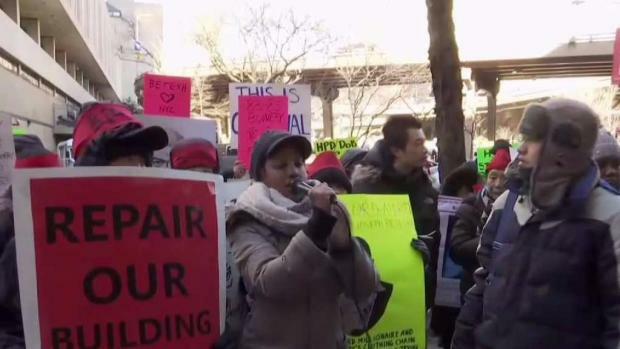 Tenants evicted from a Bowery building started a hunger strike on Thursday. About three weeks after the tenants were forced out, several tenants staged a days-long hunger strike outside the city Department of Housing Protection and Development in lower Manhattan. The tenants, who have been living a hotel since being displaced, have also claimed that Betesh was a slumlord that had allowed the building to deteriorate and wanted to evict them to then increase the rent or build a new complex. They were also embroiled in a lawsuit over whether their units in the tenement building were rent-regulated since at least 2016. A spokesman for Betesh had previously disputed claims the landlord wanted to demolish the building or replace it with a hotel or condominiums.